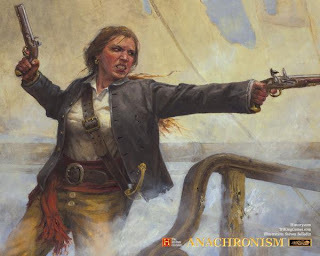 Though Anne Bonny earned herself a spot in the history books as one of the most famed female pirates off all time, she started her life of scandal right out of the gate with her birth in 1700 (or 1702 depending on source). Reputed to be the daughter of Irish attorney William Cormac and one of the family's maidservants, Anne's arrival did not please Mrs. Cormac one bit, though one account has suggested that Mrs. Cormac revealed her knowledge of her husband's affair by waiting in the maidservant's bed for William to come for one of his regular visits. However the family dealt with this new development, William absconded to Charleston, South Carolina, with the maidservant and baby Anne to start life anew. Colonial life brought prosperity to the Cormac family, and Anne grew up with a degree of privilege, though her fiery nature manifested itself early on. Some accounts claim that Anne stabbed one of her maidservants and at another time set fire to her father's plantation, but there is no conclusive evidence to support or deny either claim. Anne's wild ways led to an impulsive teenage marriage to James Bonny, a sailor with a taste for the high life, who hoped to gain control of Anne's family's fortune. William Cormac would have none of that, or of his daughter and son-in-law, so the newlyweds set sail for New Providence Island in the Bahamas. Their rocky marriage crashed. James became an informant for Governor Woodes Rogers, while Anne preferred to spend her time in local taverns rather than keeping house. It was there that she met the dashing pirate James could never be. Calico Jack Rackham, so named for his flashy style of dress, matched Anne in spirit and thirst for adventure, and the two soon began an affair. James Bonny brought his wife before Governor Rodgers to have her flogged for the crime of adultery. She was ordered to return to him to live as a proper wife. Such was the law of the land, but as pirates subscribed to a law of their own, Jack Rackham had a counter-offer. Jack offered to buy Anne from James in a divorce by purchase--not entirely legal, but accepted practice in some circles. Anne refused; she was not property to be bought and sold. Anne's sentence was passed but not carried out (foreshadowing alert), and she and Jack disappeared to embark on their piratical partnership. 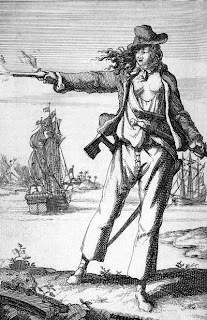 They would later acquire another companion, the female pirate Mary Read, who had a scandalous background of her own. Mary was raised in male disguise by her widowed mother, as her paternal grandmother would support a grandson but not a granddaughter. The trio wreaked havoc upon the seas, taking many prizes. Some accounts have Anne bearing Jack's child during their two years together, though varying accounts list the child as being stillborn or left to be raised with a family in Cuba. The pirate's life is said to be a merry but short one, and in 1720, Anne and company found this to be true. Captain Jonathan Barnet, working for the governor of Jamaica, captured the trio's ship. Only Anne and Mary fought to the end, the men reputedly being too drunk to fight. All were brought to trial for piracy, and Anne and Mary both plead their bellies, claiming to be pregnant, which would earn them stays of execution until their children were born. Neither execution ever took place. Mary died of a fever which may or may not have been connected to childbirth. Anne's fate was a mystery for quite some time. Had she in fact been executed? No documents or contemporary sources existed to that effect. What then? Had she died in prison like Mary? Again, no documentation existed anywhere to indicate that. Had she perhaps escaped and resumed piracy under a new identity? The truth, according to the Oxford Dictionary of National Biography, using evidence provided by Anne's descendants, is that William Cormac ransomed his daughter back to South Carolina. There she bore Jack Rackham's posthumous child. She later married James Burleigh, bearing him eight children, and lived a quiet and circumspect life until her death at the age of eighty-two. Perhaps that was her most scandalous feat of all.